Pocky Day and Pepero Day are similar unofficial observances held on November 11 in Japan and South Korea, respectively. 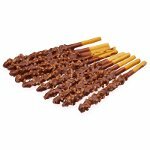 They are dedicated to chocolate-coated biscuit sticks known as Pocky in Japan and Pepero and South Korea. Pocky was first produced by the Japanese confectionery company Ezaki Glico in 1966. Today, the product line includes many variations of coatings, but chocolate coating is considered the classic one. South Korean company Lotte Confectionery began to produce its version of the snack, Pepero, in 1983. Pepero Day/Pocky Day is an observance similar to Valentine's Day. The exact origins of this day are unknown, but most people believe that it is celebrated on November 11 because the date 11/11 resembles four Pocky/Pepero sticks. On this day, it is customary to exchange these chocolate-covered snacks to show affection to friends and loved ones. The observance is especially popular among schoolchildren. Pocky Day/Pepero Day has been criticized by being a marketing tool that helps confectionery companies increase their sales. In South Korea, there has been a proposal to replace it with Garaettok Day (garaettock is a variety of Korean rice cake, formed into a long cylinder shape).